Philadelphia Vice Chair Doug Soroka FN’06 and Lynn Kleina attended the Explorers Museum Inaugural Gala opening at Charlerville Castle Ireland in September. This is the ancestral home of distinguished explorer Charles Howard Bury who was the leader of the first Everest Reconnaissance Expedition in 1921. Co-founders Former EC President Lorie Karnath FI’89 and Tim Lavery gave opening remarks followed by a fire side chat with Dr. Terry Sharrer on the importance of museums with the vision of this institution. 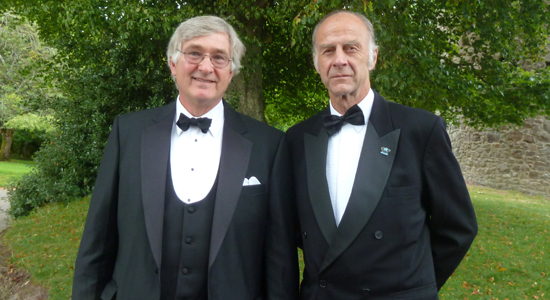 The Gala evening keynote speaker Sir Ranulph Fiennes spoke of his adventures as the first person to reach both the north and south poles by surface and the first person to cross Antarctica by foot. 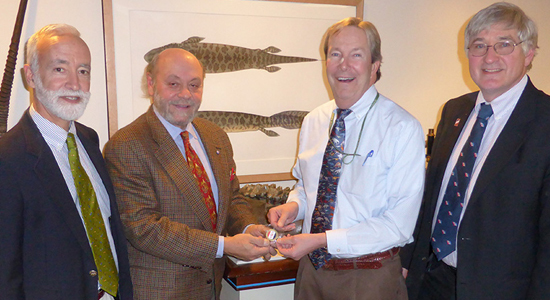 The first Philadelphia Challenge coin was awarded to Dr. George Gephart CEO of the Academy of Natural Sciences of Drexel University. Founded in 1812 the Academy is one of the oldest American museums and is situated in downtown Philadelphia. The Chapter reestablished ties with the academy on areas of mutual interest in sharing speakers, expertise, and space. Chapter Chair A.J. Buddy Obara MN’08 with members Robert Peck FN’83, James Robinson MN’14 and Doug Soroka were treated to seeing a Bison skull donated by Buffalo Bill Cody a set of Oryx horns from Dr. Livingston and the Lewis and Clark mastodon jaw bone. The Philadelphia Chapter is proud to announce that Chapter Chair A.J.” Buddy” Obara MN’08 has been elected to receive the first Rolex Artist in Residence Award. This has been based on a lifetime of wildlife sculpture in Bronze and other mediums. Mr. Obara has produced over 275 works from his studio on the Brandywine River in Pa. Some have been acquired by several US Presidents, Royalty and many other works that reside in major museums, corporate and private collections around the world. Buddy’s style is to render each animal in its natural habitat and capture the spirit and visceral mille- second that defines it. Mr. Obara will donate a bronze Emperor Penguin to The Explorers Club. He also intends to gather a list of artists, sculptors and photographers from which the Club may utilize specialized skills to document expeditions and enhance reporting via the fine arts. On Tuesday October 8th, 2013 The Philadelphia Chapter hosted in Center City Philadelphia – Dee Breger FN‘95, spoke about the Tonguska Blast in Russia in 1907. She was there on an expedition for the 100 year anniversary searching for fragments of the meteorite and investigating some of the local folk lore that has grown over the years. This impact event was the largest blast in recorded earth history and it is estimated that over 80 million trees (830 sq. miles) were knocked down. We were allowed to view a tree cross section which may hold actual particles of the original meteorite. Part of the presentation was the different ways that this event has woven its way into local culture through stories, art and interpretive dance. Capt. Joel Fogel ME’73 was a guest speaker aboard the SOLSTICE of Celebrity Cruises and spoke about his various expeditions around the world. He also observed bridge activities aboard the Mexican Navy Frigate El ARM Galeana (F-202) off the coast of the port of Manzanillo, Colima, Mexico. In late October, Greg Vizzi, former Chapter Chair Doug Soroka FN ’06 and Capt. Fogel visited Hawk Mt., Hamburg PA to view the migrating hawks. During Columbus Day Doug Soroka FN’06 spent the long weekend kayaking the small lakes and rivers in the northern area of the Adirondack Park New York.